Liberty & Society Series 1 : Why is India Poor? Why is India poor? Is it our large population? The lack of education? Our history of colonial exploitation? This monograph addresses the vital question that all of us have asked each other at one time or another. 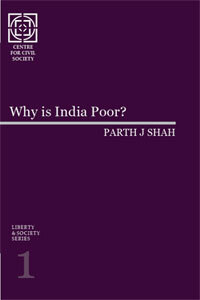 It challenges the most commonly cited causes for India’s poverty, attempts to offer plausible reasons for why India is poor and highlights the importance of institutions and policies that support economic freedom.